Newgate, Oldgate - Ramblings of Mad Shutterbug & the Border Collie Bros.
Houdini and I hung a new gate at the road entry to the Ranch today. This is out by the road, so at the end of our 'private road'. Seems not quite right somehow to call a route nearly 1/8 mile long (0.38 km) a driveway. The old gate is a rail gate, made from steel rails riveted together. Been quite bumped about by both weather and bulls and goats, with rivets popping and rails being deformed. The one on the left replaces the old one, which was very similar in pattern to the one on the right only longer. The long gate is 4.9 m / 16', the short one is 3.7 m / 12' long. The right gate rarely opens, the left constantly. 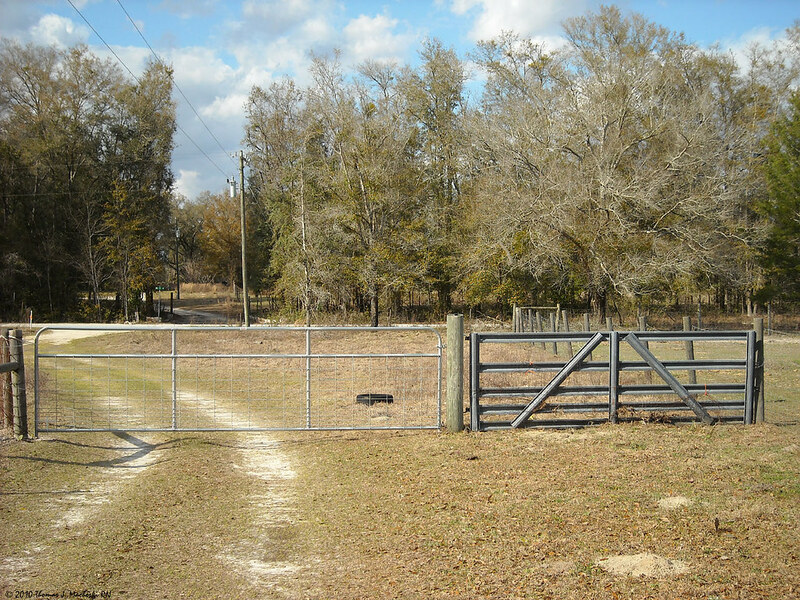 The theory behind the right gate is that we'll add more fencing some day, out to the road and over to the far side gate of the property around some pine trees. Hardly looks as if there's anything there in comparison. However, there is a heavy gauge wire panel between the tubes on the longer gate. We've used that style of gate in five other locations with great success even with cows and horses and goats leaning into them. Your new gate looks like 95% of the Aussie farm gates. It also looks like oh 80% of the US gates. Much more common to see these than the rail gates. Having now hefted one of each in close timing, I know why. The rail gate is bloody heavy. I like the new gate. interesting how the LJ photo in the post has better definition than the one in Flicker. and did I miss the post on the dial up ? Miss what post on the dial-up? I put the notice in the cut this pic is Big & not dial-up friendly. Flickr shows a somewhat smaller version of this, this is the 'large' version.